Learn about simple mechanics the fun way! The Magic School Bus meets The Way Things Work in this hilarious STEM-friendly informational fiction series perfect for budding engineers. The Invention Hunters travel the globe in their flying museum collecting the world's greatest inventions! Today they've landed in a construction zone. These silly scientists think they've stumbled on incredible specimens of everything you'd never find at a building site, from roller skates and pogo sticks to swords and race cars. 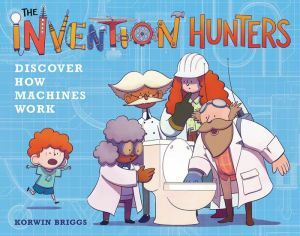 But what they really discover--with a kid as their guide--is how simple machines like pulleys, cranks, and levers are used to engineer tools ranging from jackhammers to dump trucks...and even toilets!